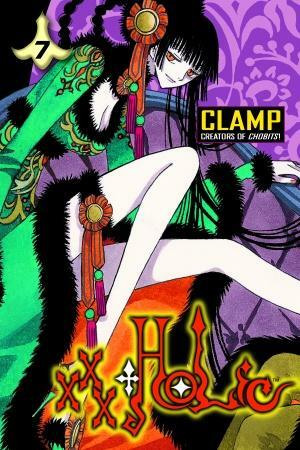 Watanuki is an orphaned teen who, in the opening of this series, wandered into Yuko's shop. Yuko is a powerful witch, and her shop is an unusual place - only those who truly have a need that she can fulfill are able to enter it. Watanuki has been plagued his entire life with the ability to see spirits, and it is driving him crazy. In return for working as Yuko's shop assistant, Yuki will make it so that Watanuki will - at some point - no longer be able to see ghosts. He has an unusual sort of relationship with his classmate, Domeki. Watanuki is envious of Domeki's skill at sports and popularity with the girls, and he is particularly jealous of his friendship with Himawari, a pretty classmate who appears to enjoy both their company but has not shown any indication of which boy she prefers. Watanuki constantly complains about Domeki - in over-the-top scenes that show him dancing around with frustration and annoyance - and Domeki certainly knows how to push his buttons. But when it comes down to it, the two boys have been through a lot together, and whether Watanuki likes it or not, they have become friends. When Domeki inadvertently becomes afflicted with a curse because he is trying to help Watanuki, Watanuki feels terrible about it and turns to Yuko for help. The only way to help his friend, he learns, is to take the curse on himself - which involves being maimed for the rest of his life. He immediately decides to take on the curse - without consulting Watanuki, who is none too pleased to learn about Watanuki's choice. As the story plays out, it raises interesting questions about friendship, duty and choice, and whether or not it is acceptable to take on such a debt for someone else without their permission. The consequences of his choice are explored in this volume, which represents a turning point in the boys' relationship. One thing I love about this series is the notes that are included at the end of the story. I learn all kinds of fascinating things about Japan and Japanese culture. For example, there is a reference to a food called ikameshi. In the notes section it tells us: "In 1941, Japan was in the midst of a rice shortage due to the war, so an enterprising food vendor started to stuff what little rice he had into squid. Then he seasoned it with soy sauce and other ingredients, slow cooked it, and sold it at Mori Starion near Hakodate on the Northern Island of Hokkaido. It as called "ikameshi" (squid-rice), and it became one of the most popular ekiben (train-station boxed lunches) in all of Japan." Fascinating, isn't it?! I continue to enjoy my reread of this manga series, which is steeped in Japanese legend and folklore and also explores issues that are relevant to readers' lives. It always leaves me with some very interesting food for thought. Have you reviewed this volume? If so, please leave a link in the comments, and I'll add it here. This sounds great, especially all the info about Japanese culture. I didn't know that about ikameshi! I haven't read this manga before, so I'm going to try it. Chasingbawa - Oh, I hope you enjoy it. It's one of my favorites! I've never had ikameshi, but it sounds delicious. There is a lot about food and drink in the series because Watanuki is an amazing cook. It always makes me hungry to read these books! Every time I read your reviews it just reminds me how rubbish I am for not having started it yet. The covers are just stunning and I promise to start them this year. Rhinoa - I feel the same way when I read everyone else's reviews of other manga and graphic novels that I've been meaning to try. There are so many great ones out there! I do love this one a whole lot, though, and I'm pretty sure you will, too. I'll be looking forward to hearing what you think whenever you manage to get around to reading these.